On Saturday October 7th the SSR (Saturday Social Rides) will head over to Semer, so that those who want to have a go can and others can offer support. Anyone arriving early can get a coffee from Hollow Tree Farm nearby. We are planning a coaching session Sat 3rd Dec 2016 at Foxhall Stadium, Ipswich – IP4 5QW. Please use the Foxhall Road entrance to the stadium if you are travelling by car. Coaches Ross, Adam and Peter will greet you and run the session. The session will focus on some skills and ‘fun’ racing. The session will run from 10am-12noon for riders aged 7yrs+ incorporating Adults too. Club membership is not essential but you are always welcome to join . Important – Please arrive no later than 9.45am – Parents that haven’t completed a consent form this year as yet, we will have some to complete on the day. Don‘t forget your bicycle (in full working order), helmet, gloves and drink, £3.00 per rider and appropriate ‘warm’ clothing for the weather, it is likely to be cold! 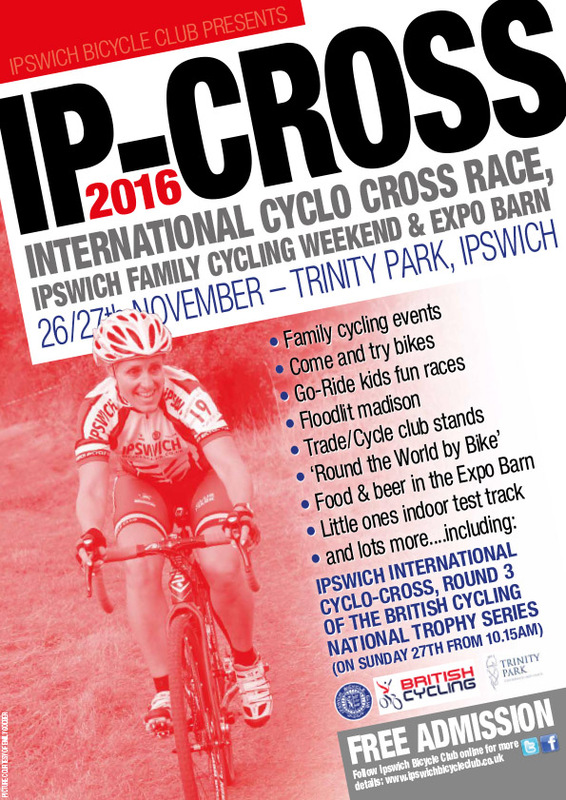 The session is aimed at the off-road discipline so cyclo-cross or mtb bikes with off-road tyres are most suitable. If there are high winds on the day sessions may be cancelled. Please phone to check. It’s coming !!! 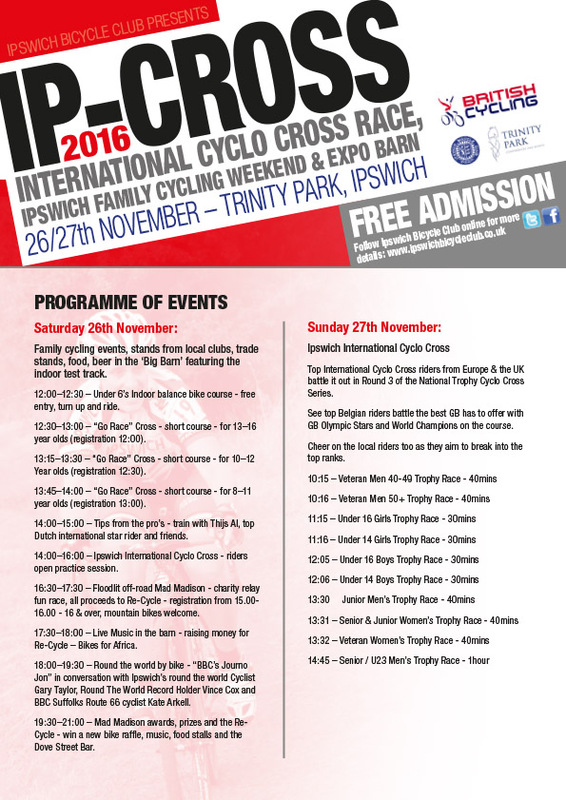 Here are the details of the biggest event on our calendar and the biggest local event the year our forthcoming Ip-Cross International Cyclo Cross Weekend at Trinity Park. Volunteers needed, Don’t be shy, It’s a great event to be part of & one you will remember. All volunteers will receive endless thanks oh, and free food & drinks vouchers. If you would like to help please call Steve Grimwood on 07710 288208 or email steve@elmycycles.co.uk to volunteer.